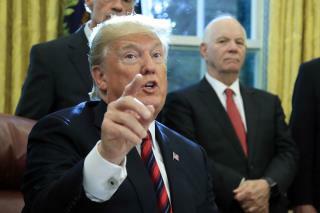 (Newser) – A battle is brewing between the Trump administration and some of the president's biggest supporters in Congress who are concerned that sanctions to be re-imposed on Iran early next month won't be tough enough, the AP reports. As President Donald Trump prepares to re-impose a second batch of Iran sanctions that had been eased under the 2015 nuclear deal, conservative lawmakers and outside advisers have become worried that the administration may break a promise to exert "maximum pressure" on Iran. They are angered by suggestions that measures to be announced Nov. 5 won't include a provision cutting Iran off from a key component of the global financial system. The self-described Iran hawks are concerned enough that they have drafted legislation that would require the administration to demand that Iran be suspended from the international bank transfer system known as SWIFT. "The president asked for maximum pressure, not semi-maximum pressure," says Richard Goldberg, a former aide to a Republican senator. "Maximum pressure includes disconnecting Iranian banks from SWIFT." Trump pledged Thursday to do whatever it takes to pressure Iran to halt what he refers to as its "malign conduct" such as nuclear and missile development and support for Middle East terrorism. Iran deal supporters argue that pushing Iran out of SWIFT will lead to the creation of alternate mechanisms that could supplant it as the leading global institution for financial institutions to send and receive information about banking transactions. President Trump has his reasons. That is good enough for me. His instincts are superior to anyone in Congress. Once again we see the Conservative traitors falling over themselves in their rush to put the interests of Israel ahead of the interests of the United States that they hate so much. It is Israel who has the strong hate for Iran. Israel wants to rule the region using all the US weapons US taxpayer pay for and give to Israel. Trump is in the pocket of Israel. The same people who give money to the Trump campaign are also the people who are the big spenders who back Netanyahu. I would bet any money that the so called Iran hawks are heavily financed by AIPAC which is the American association which bribes for all things Israel. It is Israel who gets the bulk of US aid and they are a prosperous nation who doesn't need it. We need a president who is not that handmaiden of all that is evil on the planet.